Six lectures on the nature of totalitarianism delivered at the New School for Social Research in March and April of 1953. The Great Tradition I. Land and Power. Social Research Vol 74: No 3: 2007. The Great Tradition II. Ruling and Being Ruled. Social Research Vol 74: No 4: 2007. Published as Karl Marx and the Tradition of Western Political Thought. Social Research Vol 69: No 2: 2002. Social Research Vol 71 : No 3 (Fall 2004). Lecture course given at the University of California–Berkeley in the spring of 1955. The last lectures is published as “Epiloque” in Arendt: The Promise of Politics. Edited with an Introduction by Jerome Kohn. Schocken, New York 2005. Lectures at the New School for Social Research 1965-66. Published as “Some Questions of Moral Philosophy 1965-66”. In Arendt Responsibility and Judgement.Responsibility and Judgment. Edited with an introduction by Jerome Kohn. Schocken, New York 2003. Lectures on Kant’s political philosophy delivered at the New School for Social Research in the Fall of 1970. 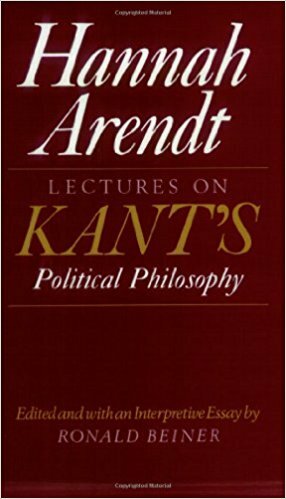 Published as Lectures on Kant’s Political Philosophy. Edited and with an Interpretive Essay by Ronald Beiner. The University of Chicago Press, 1992.